The global health organisation Vital Strategies has become a leading actor in the worldwide battle against obesity, which affects 2 billion people globally. Building on its tradition of working to cut tobacco consumption and traffic injuries, the organisation tackled sugary drink consumption as a flagship issue for policy change. While the famous 2013 “soda ban” proposed by former Mayor Michael Bloomberg in New York City was one of the early policy initiatives on sugary drinks consumption, it failed to ever become law. However, in the intervening 6 years a number of national governments and (in the case of the US) state governments have begun to consider and adopt measures that use label and price policies to discourage unhealthy sugar consumption and promote healthier food choices. At the same time, the issue has continued to draw controversy. In January, representatives of Italy and the United States asked the World Health Organization to remove a summary of evidence on efficacy of taxes on sugar-sweetened drinks from the WHO Prevention and Control of Noncommunicable Diseases update and Workplan, following on the United Nations General Assembly’s High Level Meeting on NCDs in September 2018. These are due to be reviewed by the World Health Assembly in May. In March, a major study in The BMJ analysed the history of how leading sugary drink brands for children were developed and marketed, using strategies from the tobacco industry. Against this backdrop, Health Policy Watch recently spoke with Sandra Mullin, Senior Vice President of Vital Strategies for Policy, Advocacy and Communications, about Vital Strategies’ worldwide outreach on sugary drinks marketing and consumption. Health Policy Watch (HPW): Stepping back a bit, what is the evidence about sugary drinks’ links to obesity (and diabetes) and when did this first emerge as a prominent issue on the global policy scene? Sandra Mullin (SM): Calls for policies to address sugary drinks as a contributor to death and disease go back decades, but the last ten years the urgency has increased as evidence has mounted. Most recently, a number of large-scale studies have found a link between consumption of sugary drinks and overweight, obesity and diabetes, leading WHO to support policies that reduce consumption. WHO has warned about the links between excess sugar consumption and chronic disease since at least 1990, and published its guidelines on sugar consumption in 2015. This document is heavily cited in advocacy for policy action. Looking back, we see the “Perspective” piece published in the New England Journal of Medicine a decade ago as a milestone moment. Authored by Kelly D. Brownell, Director of the Rudd Center for Food Policy and Obesity at Yale, and Tom Frieden, then Director of the U.S. Centers for Disease Control and Prevention (who now leads the Resolve to Save Lives initiative at Vital Strategies), the paper posits that sugary beverages may be the single largest cause of the obesity epidemic and an excise tax of one cent per ounce could reduce consumption by more than 10 percent. 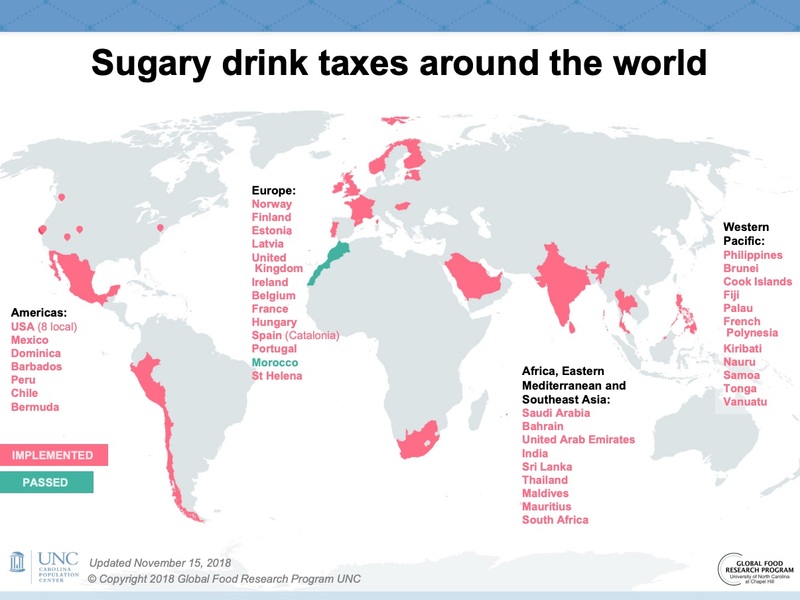 Research from the University of North Carolina shows that individual countries have cited health as a reason to increase taxation on sugary or artificially sweetened drinks since Norway in 1981 and Samoa’s introduction of a tax on carbonated beverages in 1984. HPW: When did Vital Strategies first get into this issue – and how has your focus been divided between levers such as awareness raising and behaviour change, labelling, pricing policies, or other themes? SM: We began our obesity prevention work in Mexico in 2013, by providing technical assistance to El Poder del Consumidor [The Power of the Consumer] in its efforts to build support for a tax on sugary drinks. In 2016, this grew into a more formal program of work across five low- and middle-income countries (Mexico, Colombia, Brazil, South Africa, Jamaica and Barbados) under Bloomberg Philanthropies’ Obesity Prevention Program. 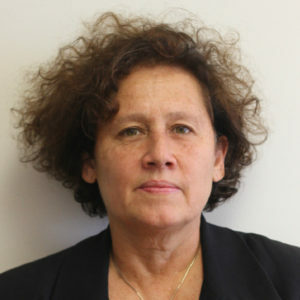 Additionally, as an implementing partner in the Partnership for Healthy Cities, which enables 54 cities around the world to deliver high-impact interventions to reduce noncommunicable disease (NCD) risk, Vital Strategies is providing technical assistance to large-population cities that are focusing on initiatives to promote healthier food and reduce consumption of sugary drinks. Our main focus is to support policies that make the healthy choice, easier. This includes restricting the marketing and availability of unhealthy products to children, clear warning labels, communication campaigns to create awareness, and pricing and tax policies designed to deter consumption. Public health experts know these policies work, but often progress is delayed by a lack of knowledge or support among the public and policymakers, and by industry interference. Raising awareness about the urgency of the obesity epidemic and its drivers is crucial to change. We work with local government and civil society partners to influence effective policy development, implementation and enforcement. Our country partners determine our focus. They understand the context and the opportunities best. In South Africa, we supported HEALA (the Healthy Living Alliance) in implementing communication campaigns that increased public support for the recently-implemented sugary drinks tax (health promotion levy). 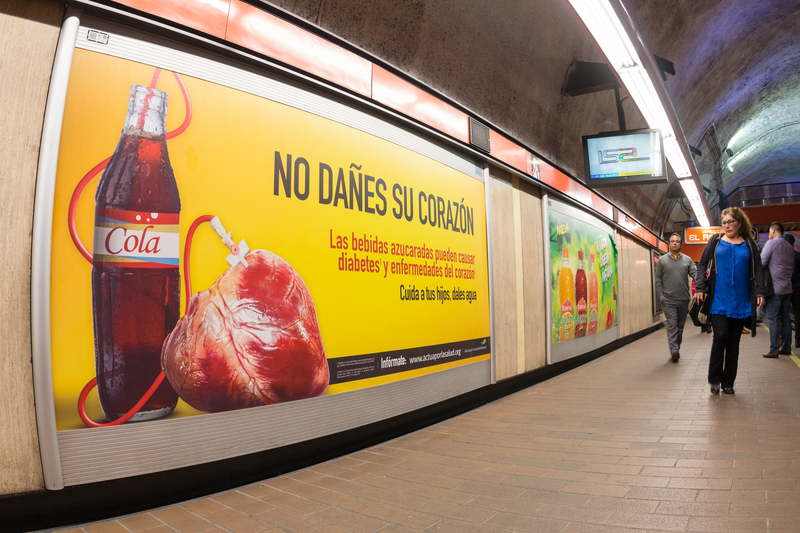 In Colombia, we support Red PaPaz in its work to build community and policymaker support for clear warning labels on food packaging and increase support for a sugary drinks tax. We have also undertaken global efforts to show how industries interfere with policy making designed to improve health. Our publication of “Fool Me Twice” in 2017 details how multinational junk food and soda companies are using tactics similar to those of the tobacco industry. HPW: Among those policy levers – where do you now see the most opportunities? (awareness raising, pricing policies, labelling, etc.)? SM: Making the healthier choice the easiest choice requires policy. To achieve sustainable change, we must address the environment and make it clear that the issue of obesity is not merely a matter of individual choice. One of the simplest and most effective way of achieving population-level reductions in the consumption of sugary drinks is through taxation – a policy that appeals to both ministries of health and ministries of finance seeking ways to increase domestic financing. But this is a significant area of industry opposition as well. HPW: In terms of geographic focus – It seems that Mexico was a priority country for your efforts – what has been achieved there and do you see this as a model for action elsewhere? SM: Mexico is a terrific model for several reasons: first, it is a great example of a successful advocacy strategy, which included building support for policy change among the public and policymakers. Second, it linked the tax increase being proposed and the funds that would generate with a public benefit, namely increasing the supply of water fountains in schools. And third, it provided researchers with an opportunity to measure the effects of the policy change. Data from Mexico has shown a reduction in consumption, particularly among the poor, who suffer disproportionate health and economic harm from consumption of sugary drinks. It’s also helped provide further evidence to support policy change in other countries around the world and to counter misleading arguments from the global soda industry. HPW: And there also seem to be a cluster of other countries in Latin America where this issue is very much evident, Brazil, Colombia and Chile to name a few? Is this because of the high prevalence of obesity and sugar consumption in the America’s region as compared to elsewhere in the developing world? What is the status there and what are your priorities? SM: There has been some activity across Central and South America, ranging from increases in public knowledge and support, to policy implementation – and we’ve seen activity across the world, too. In Mexico and Chile, media and researchers are assessing the success of recently-introduced pricing and labelling policies. This research is being shared, promoted and used to support the case for policy change in other countries. It’s likely there’s an increase in government action across the globe because so many countries are facing the same NCD disease burden from the same causes, and the need to fund health systems. WHO’s guidance on the issue, and the larger global movement to reduce NCDs, has also played a critical role. Regional and global progress on key policy areas is well-summarised in fact sheets and policy maps produced by the University of North Carolina. HPW: And what about the US? SM: The regulatory model in the US is different compared with countries where pricing and taxation are decided in a national legislative process. In the US, decisions on these issues are done on a local level; local policymakers and community advocacy are required. Despite the beverage industry’s significant effort to prevent these initiatives, taxes on sugary drinks have been successfully introduced in several cities and states and there’s growing interest in these policies across the nation. HPW: Isn’t the recent BMJ story about big tobacco’s hand in advertising for sugary drinks just one more chapter in a long narrative about how advertising shapes our food choices? What is special or different about this story? SM: There is definitely a sense of déjà vu. Vital Strategies’ “Fool Me Twice” report detailed how international soda companies are using tobacco industry tactics to derail public health policies that could reduce obesity and improve population health. UCSF’s detailed work, published in BMJ, show these industries are even more closely entangled than we thought. Big Soda directly inherited egregious, youth-focused marketing tactics from Big Tobacco and continues to intentionally use those tactics today. Policymakers should prohibit these vested interests from participating in policymaking, and consumers need to be wary of how these products are marketed, especially to children. HPW: At the last WHO Executive Board meeting, WHO faced heavy criticism for including an annex on efficacy of sugary drinks pricing policies into its Update on Prevention and Control of NCDs following on from the UN GA’s High Level Meeting on NCDs in September 2018. Delegates from Italy and the USA, in particular, said global efforts should focus on behaviour change and not pricing policies [See 30 January Health Policy Watch]. What’s your take on that argument? SM: WHO was justified in drawing attention to the pricing of sugary drinks. We’ll never see the rapid change we need without addressing the obesogenic environments in which people live. Pricing policies and consumer behaviours are two sides of the same coin. Studies in Mexico, other countries and US states confirm that pricing of sugary drinks drives behaviour, resulting in less purchasing and consumption. HPW: What about WHO’s role in tackling this thorny issue – what is WHO doing well and where do more efforts need to be made? SM: WHO has been critically important in elevating the global importance of obesity prevention and endorsing a policy-driven approach at country-level. WHO has drawn attention to the links between sugary drinks and NCDs and voiced clear support for policies to reduce consumption, including taxation and pricing policies. This include WHO experts providing comment and expertise to policymakers in countries like South Africa to support policy change. It ensured that pricing of sugary drinks was included in the High Level Meeting on NCDs, against stiff political resistance from countries like the USA and Italy, and powerful commercial interests. To focus policymakers’ attention on this issue, we’d like WHO to classify taxation and pricing of sugary drinks as a “Best Buy” to reduce NCDs. This would be an even more resounding call from WHO to Member States to take the actions needed. HPW: Who are the other stakeholders that you see as important influencers, champions or coalition partners? What about WTO – I understand that they have had something to say about this too in the context of global trade? SM: While NCDs drive more than 70 percent of global deaths, they receive only 2 percent of global funding. We urgently need the global community – including governments, health professionals and civil society – to come together to address the leading drivers of NCDs, including the global epidemic of obesity and related disease. Forward-looking governments in several countries around the world, civil society leaders like El Poder del Consumidor in Mexico, technical and research experts like the University of North Carolina, and global health leaders like WHO and Bloomberg Philanthropies are playing an important role in generating new progress, sharing knowledge, developing the evidence base and promoting best practice. With respect to the role of trade agreements and organisations, the food industry has used intellectual property and trade arguments to lobby against regulation, but the experience of tobacco control shows that governments retain a substantial right to regulate to protect health. HPW: What else would you like to see happening on this policy issue globally and regionally in the wake of last year’s UN High Level meeting? SM: We’d like to see progress on obesity prevention, including support for the taxation of unhealthy products including sugary drinks, at this year’s World Health Assembly. Moreover, taxation of sugary drinks should be included as a WHO Best Buy to help focus policymakers’ attention and resources, and counter industry interference. We’d also like more countries to join world leaders like Mexico and Chile in implementing policies, such as clear and accurate warning labels on food and beverage packaging; increasing public education efforts to enable healthier choices from childhood; acting to restrict availability and marketing of unhealthy products, especially to protect children; and using pricing and taxation measures to reduce consumption. If we reduce the consumption of sugary drinks and unhealthy food, we can reduce obesity and related disease. To achieve this, policymakers must have the political will to implement effective policies by resisting industry influence and put lives before profits. Image Credits: Bloomberg Philanthropies, University of North Carolina.